To investigate whether the use of routinely obtained chest X-rays is necessary after elective VATS. 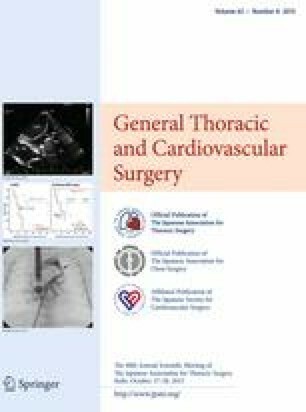 We retrospectively reviewed 1097 chest X-rays obtained routinely after elective VATS, performed in patients aged over 15 years during an 18-month period. VATS procedures were divided into three groups according to the degree of pulmonary resection. The chest X-rays (obtained anterior–posterior in one plane with the patient in the supine position) were categorized as abnormal if showing pneumothorax >5 cm, possible intra-thoracic bleeding and/or a displaced chest tube. Medical charts were reviewed for all patients with abnormal chest X-rays to see if an intervention was made based on the X-ray. In case of an intervention, detailed clinical data were collected. 44 of 1097 chest X-rays (4.0 %) were abnormal and 10 of these X-rays (0.9 %) led to a clinical intervention. Proportions of abnormal chest X-rays were unequally distributed between groups (p < 0.001), whereas the number of interventions was not (p = 0.43). Of the ten chests X-rays that led to an intervention, three showed possible intra-thoracic bleeding, six showed pneumothorax >5 cm and one showed a kinked chest tube. All the patients with possible intra-thoracic bleeding were re-explored in the operating theatre the same day. Only 10 of 1097 chest X-rays (0.9 %) obtained routinely after elective VATS procedures led to a clinical intervention, supporting the abandon of routine chest X rays in favour of a more individualised approach, based on clinical observations. Lars S. Bjerregaard and Katrine Jensen declare no conflicts of interest. René Horsleben Petersen is speaker for Covidien, Takeda and Medela. Henrik Jessen Hansen is speaker for Covidien.